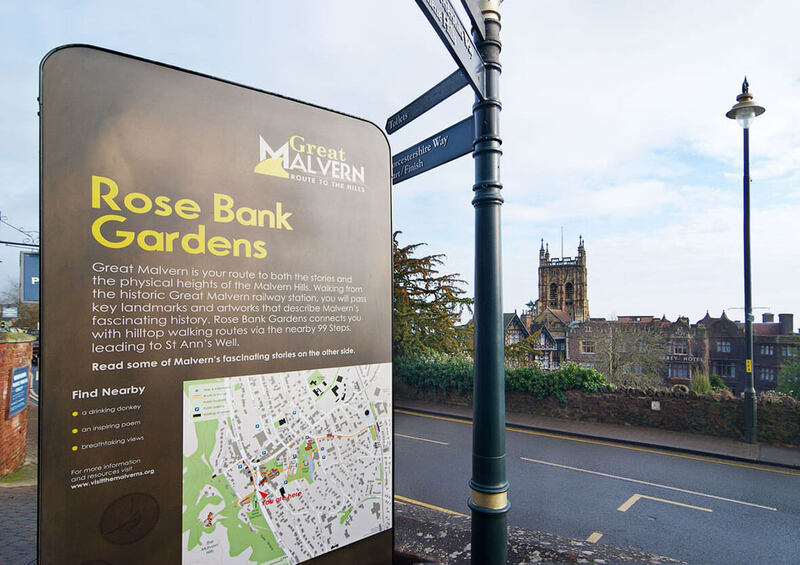 Reade Signs architectural signage team have many years’ experience delivering major signage projects for corporate and public sector clients. We work closely with architects and design professionals to turn their concepts into reality. Working alongside award winning experiential design company, Outside Studios, Reade Signs was briefed to design and engineer a range of interpretive signs and structures throughout the historic spa town of Great Malvern in the West Midlands, famous for its 15km of ancient rocks and hills that surround the town and attract a wide range of visitors year round. 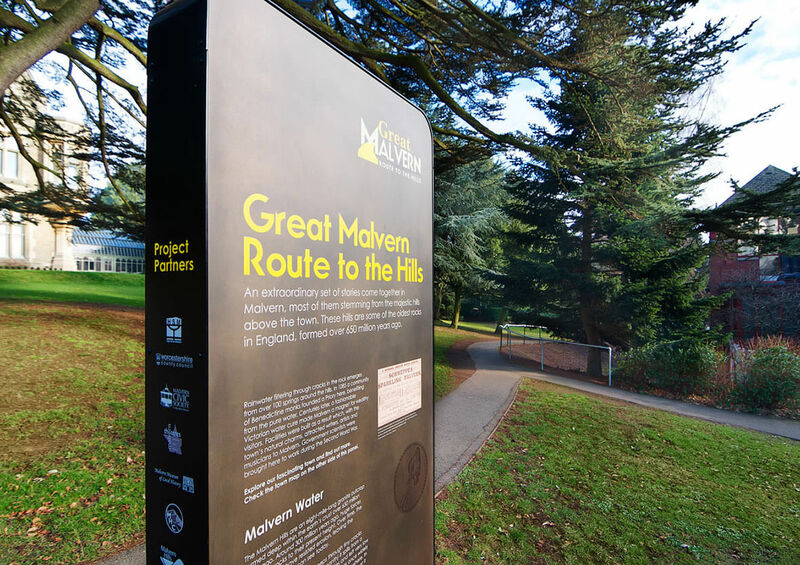 The objective of the ‘Route to the Hills’ project was to create an interpretation trail between The Malvern Hills and the town itself, showcasing its heritage and migrating walkers from the hills and into the town through a series of bespoke plaques, artwork and signage. 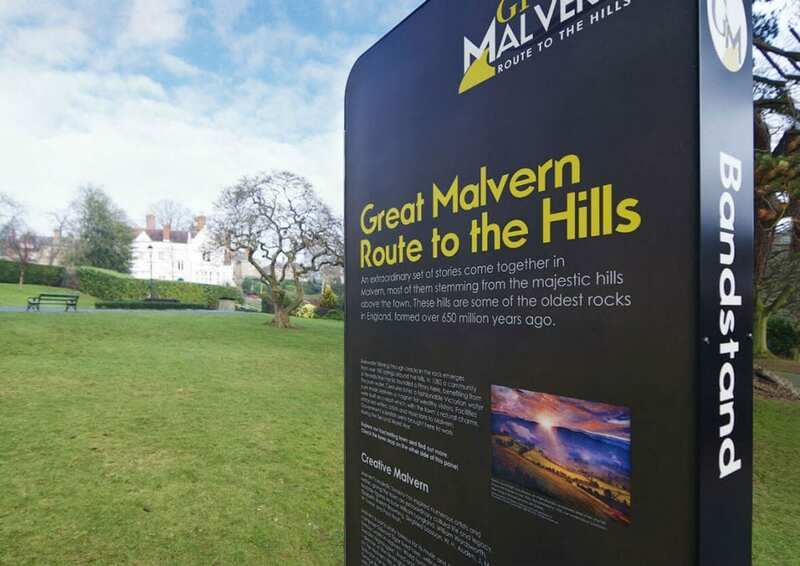 It was imperative that the series of signs complemented the Malvern Stone used throughout the town. The client’s original vision was to use bronze but with it being a notoriously expensive material and prone to degrading and tarnishing, this was a concern. Certainly not ideal as the structures would all be outside and subject to all manner of weather conditions and potential graffiti. Another stipulation was that the signs needed the ability to be easily removed, leaving a finished and risk-free surface once extracted. 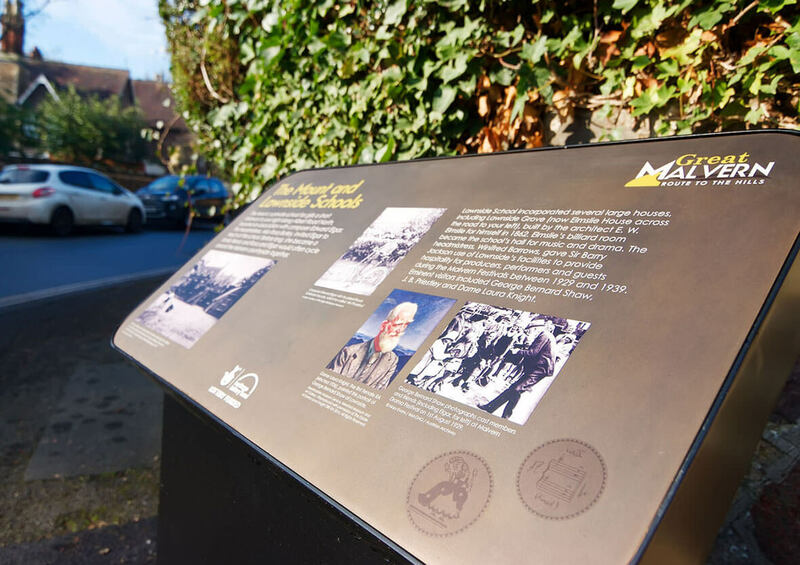 Reade Signs’ experienced team suggested using aluminium panels coated with Verometal – a thin, painted coating containing bronze – to achieve the desired bronze effect at minimal cost and with even greater usability. We conducted a thorough proto-typing process to ensure the perfect patina was found and agreed by the client. We also advised that a suitable lacquer be applied so that all signage was weather resistant and graffiti-proof. We advised that Nal Retention Sockets would be the ideal solution to enable the signs to be effortlessly removed. A template the size of the actual signs was manufactured and used to ensure the Reade installation team plotted and fixed the Nal Sockets with 100% accuracy and precision. By the time it came to fitting the actual signage, it was as simple as slotting the structures into place. 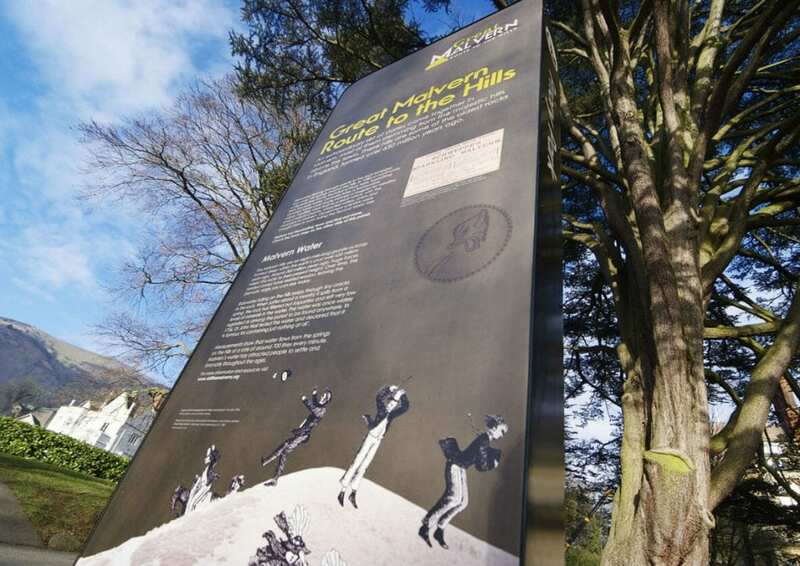 Reade Signs’ expert knowledge and experience enabled the customer’s visions to become a reality; saving money without compromise, using the best materials and providing the utmost attention and care throughout the entire process.